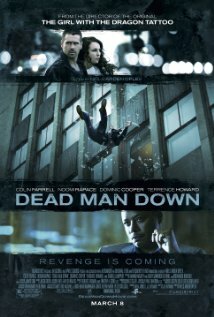 Dead Man Down doesn’t quite work: not-so-deep in its not-so-rotten core is a romance that’s not rendered romantically; and the action isn’t good enough to stand out on its own (as in the District 13 films say). Visually, the film is serviceable but doesn’t dazzle; and there’s something off and perhaps off-putting, at least to American audiences, in having all these Europeans in what is essentially a New York movie. Yet, what actors they are! Colin Farrell is getting more handsome as he ages, and he’s got gravitas now; when he was younger, his charm was that he evoked a sense of life as a whiz on whiz; that everything was fun with the right drugs. Now he conveys the feeling of a man who’s lived, who’s had troubles, who thinks, and a lot of that thinking is about what’s made him unhappy. Of course, that’s the role; but he seems to inhabit that brooding presence; he kind of evokes a melancholy menace just with his stillness. Noomi Rapace is harder to watch. She’s got an unusual and unsettling presence (you can understand why she was cast in The Girl With the Dragon Tattoo). She’s got a face with wide, flat, rounded cheekbones that can come across as plain; and in some scenes here she seems kind of stumpy in her too-high heels; but suddenly she can also unfurl a stream of fury, or evoke a kind of ease with skill, or make herself seem an original and startling beauty. It’s a role and a story that seem to have confused some critics but that make perfect sense to me: a girl who’s been damaged unconsciously sees her life ruined whilst the cause of it gets off scot free and wants revenge. She meets a man, also, hell-bent on revenge. They’re opposites, she claims to be talkative though we never see her in quite that way; he claims to be reticent; though we never quite see him that way with her. They’re clearly made for each other. The film offers excellent reasons why she’s one way in the beginning and quite different at the end (Farrell changes with her, though less mercurially, as befits the plot). Terence Howard is in it, slimmer and more handsome than previously though never quiet as threatening as he should be. F. Murray Abraham also appears (and it feels odd that he’s the only one in the whole film, including Howard, who really seems to belong in NYC). Poor Dominic Cooper is given the role that redeems the hero. The person who makes the greatest impression in the shortest time is Isabelle Huppert: like very few actors on film, Vanessa Redgrave is one of the few examples that come to mind, she can conjure a role into existence out of mere line readings and minimal gestures. and delight the audience with a non-existent part; it’s a lovely kind of witchcraft. Dead Mand Down is not for purists; those who like action will be pleased without being thrilled; those who like noir will have seen darker examples; it’s a romance that’s not a comedy and that lingers longer on loneliness than is comfortable. But people who like an interesting and intriguing combination of all of the above, with superb actors who seem to be growing in skill right in front of your eyes, will find a lot to look at and like.